Identification: Wings are brown-black; hindwing is lobed. Forewing has transparent gold spots; underside of hindwing has a metallic silver band. Life history: Adults perch upside down under leaves at night and on hot or cloudy days. To seek females males perch on branches and tall weeds, and occasionally patrol. Females lay single eggs near the host trees, and the caterpillars must find their proper host. Young caterpillars live in a folded leaf shelter; older ones live in a nest of silked-together leaves. Chrysalids hibernate. Flight: Two broods from May-September in most of the East, a single brood to the north and west, three-four broods from February-December in the Deep South. Caterpillar hosts: Many woody legumes including black locust (Robinia pseudacacia), honey locust (Gleditsia triacanthos) and false indigo (Amorpha species). Also selected herbaceous legumes such s Glycyrrhiza species. 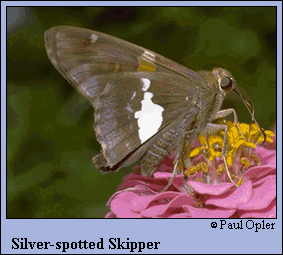 Adult food: The Silver-spotted Skipper almost never visits yellow flowers but favors blue, red, pink, purple, and sometimes white and cream-colored ones. These include everlasting pea, common milkweed, red clover, buttonbush, blazing star, and thistles. Habitat: Disturbed and open woods, foothill streamcourses, prairie waterways. Range: Extreme southern Canada and most of the continental United States except the Great Basin and west Texas; northern Mexico.